I already started a brief general question, denominated #82841 on this. But this instance was brought up by "report an error" function. So I will go with this thread, starting here. 3) Based on running the OS off the CD in another computer, where the Gnome Terminal did come up fine, I expected to see that when installed on this computer, all applications would be able to be displayed. 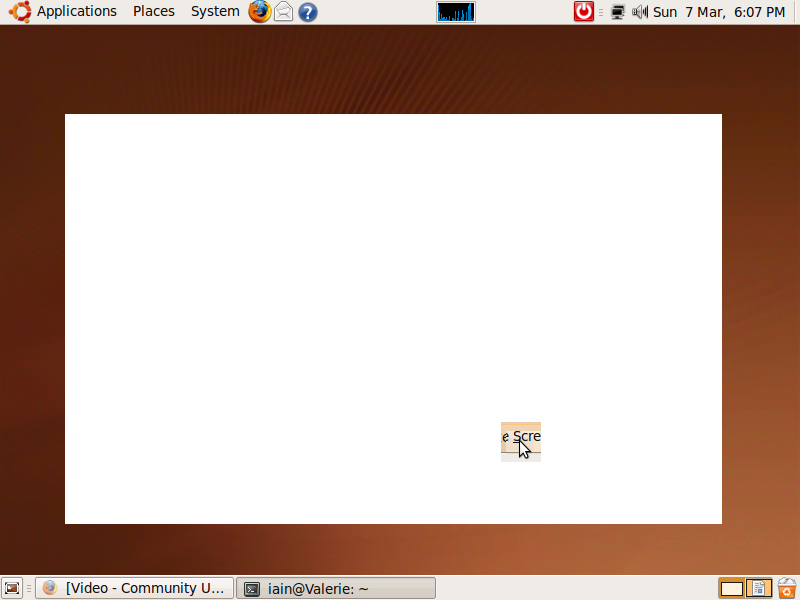 a) When I try to start Applications/Accessories/Terminal (Gnome Terminal) what comes up is a white screen block. mouse pointer shows up as an arrow. Below that, the mouse pointer is a text cursor bar (letter I-shaped). the menubar background is white, so the legends for the menu choices is not seen. When I right-click in the text area, a menu list comes up, with one of the choices as "Close Window" (works). there, a similar square persists where the pointer was when the new entity is opened up. Etc. Very irritating. at least a few other applications that do this. BTW, I did try the procedure suggested as an answer to my Question #82841, but it did nothing to help (or hurt). thanks for the report, could you please take an screenshot of the issue? thanks. I currently have installed a secondary AGP card on the board. To get the screen shot Iwill have to uninstall the card, Will do ASAP. I "cured" the problem by installing a good quality AGP card. you know -- Best regards! > I have the same problem. I've added a screenshot of the terminal window. > window or with a menu item selected. > of items you see when you click on something. > when you click on the place where 'Help' should be. I had the same issue on IBM NetVista 6579 - TAU with Intel 815E chipset and 82815 graphics. Iain Brown Douglas' fix also worked for me. Ubuntu: Ubuntu Terminal application does not work on Dell 1MHz GX150 (i815E chipset). Gives white window with no content. Same for Synaptics application manager, Why? Video? ?